This one I have had for a while; I bought it because it looks cool (at least to me! ), even if it is pretty limited to fantasy style battlefields. It has a nice big foot-print (a crucial thing I find) and should make a nice centre-piece for some games, hopefully sooner than later. 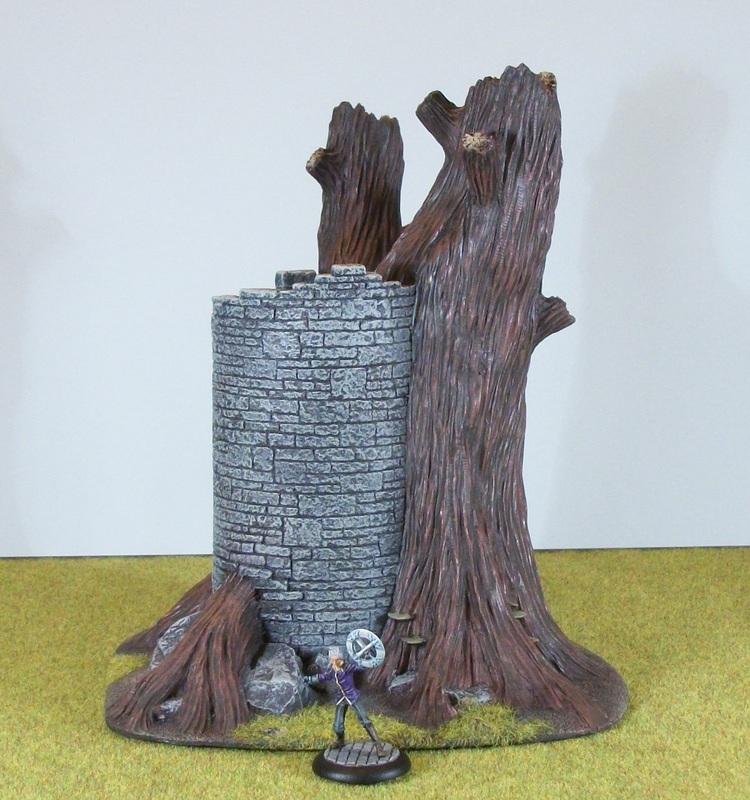 The miniature there for scale reference is a Wissenschaft Agent from Anima Tactics, mounted on a 30mm base. It is well-cast and like the other Battlefield In A Box items comes pre-painted - a real boon to me, with time being at a premium for hobby stuff. I am such a slow painter that anything that can save me time is a real plus. 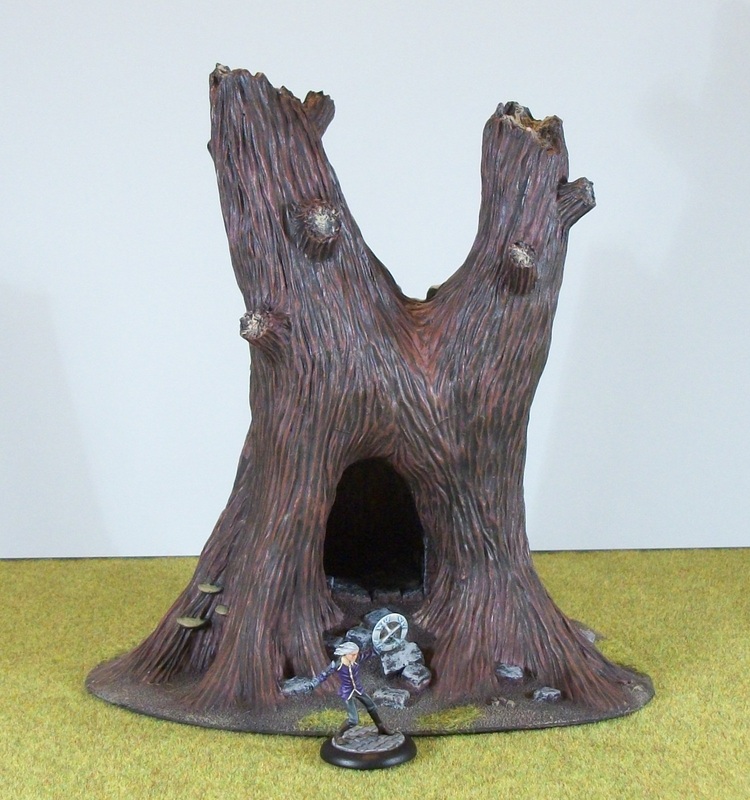 With a RRP of £25, I do think this is good value for what you get; it is solidly cast and neatly painted. Of course there are some that would baulk at paying for terrain, but at the price, for the size, I think it is value for money, but your mileage may vary as they say. Whoever they are (okay, I have been known to say it, but I am waffling now...). The static grass comes in a pouch, so is optional; but if you want it, you have to do the work yourself. This is no great effort, but just be aware. 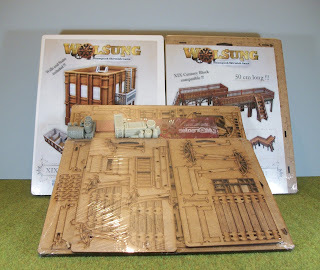 Micro Art Studios recently ran an Indiegogo campaign for their upcoming Wolsung skirmish game. I checked it out for one reason only: the gorgeous scenery. I first saw their stuff when it was previewed at Salute 2012 (click for link) and knew I wanted some from then on. The success of the Indiegogo campaign unlocked some bonuses and so I have ended up with x2 apartments x2 packs of walkways; a pack of street furniture stuff; and another pack which I have not yet figured out. In addition I got a Wolsung range ruler and a couple of resin pieces which will do for a number of eras as small barricades. 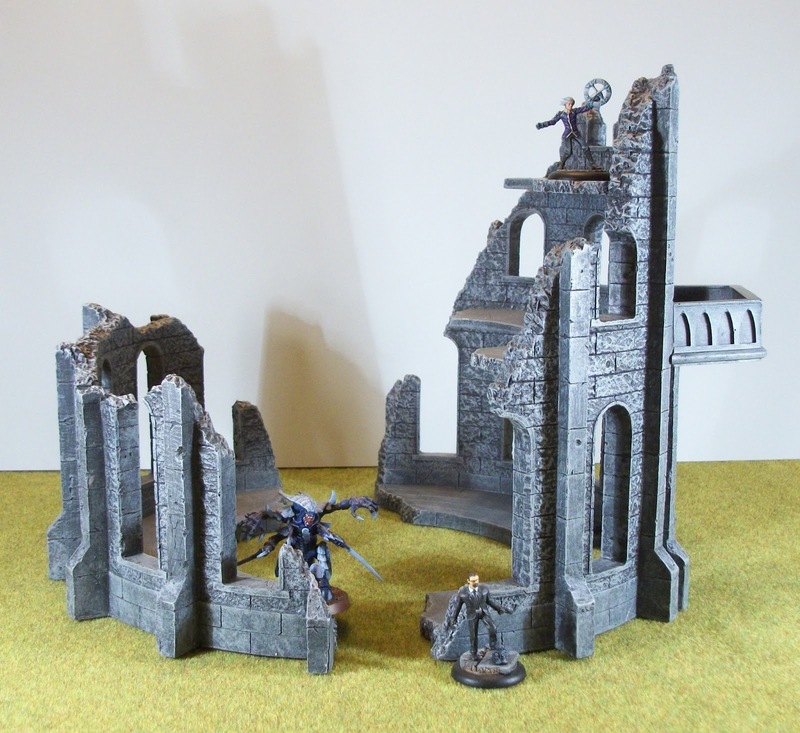 I have no plans to get into Wolsung, but I love this terrain, and cannot wait to build up some cool bits and bobs with it. Stay tuned fro updates. Okay, these are post-Christmas treats, I have to admit! I received an Amazon gift card for Christmas among other stuff (there are other internet retailers of course...), but could not think of any books, DVD's or CD's that I wanted to get. 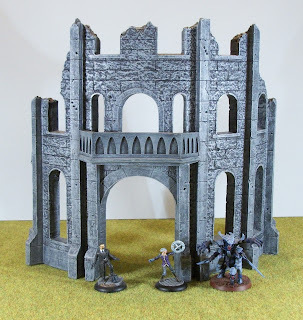 Then I had a thought - I have been looking at getting these for ages, but was put off by the price (hey, how many minis could I get for the equivalent money instead!). Amazon had the items I wanted and with the gift card, I was able to afford both by topping up with a few extra pounds and I particularly am glad I did. 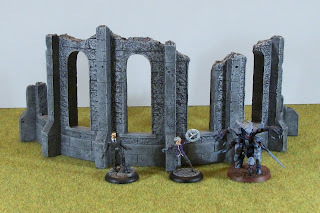 I can see these featuring as the ruins of a Gothic keep, for some Victoriana style gaming and/or maybe pulp, or even AE-WWII; as a fantasy ruin (and specifically Anima Tactics and Reaver Lords); futuristic gaming over some grim-dark war-ravaged world (yes, I may play WH40K again one day...). i am sure they could do duty in other genres too. For scale reference you have: Gentleman (Pulp City); Wissenschaft Agent (Anima Tactics); Tyranid Warrior (WH40K). Bases are 30mm for Gentleman and Wissenschaft Agent, 40mm for the Tyranid Warrior. The footprint of the bigger piece is pretty hefty and it measures 10 inches high. 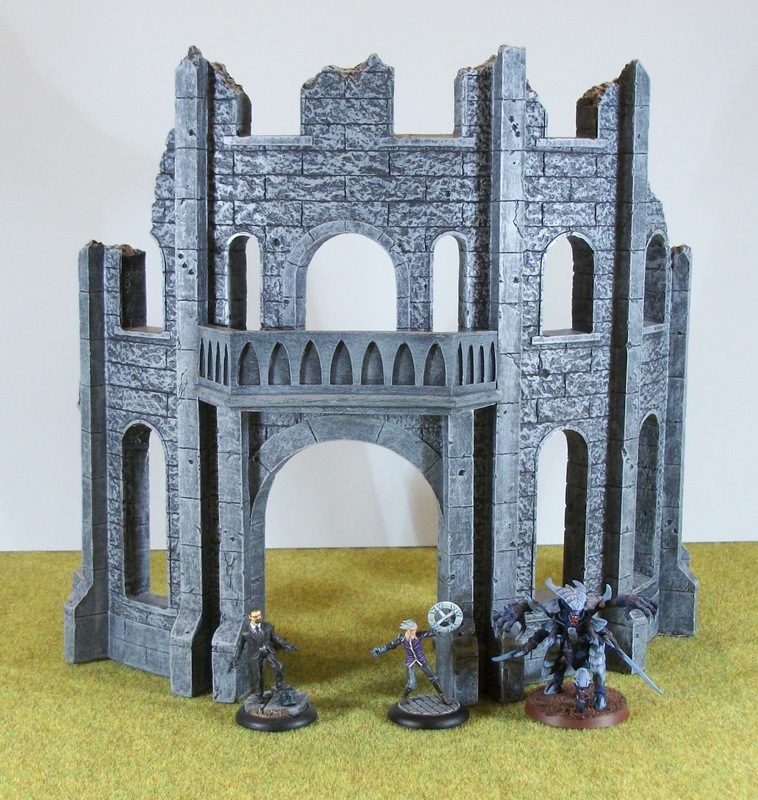 The balconies are 50mm wide so useful for deploying a number of minis. The two can be used together or separately of course, but they will form a decent LOS blocking area of the battlefield. The two items are (bigger piece) Hall Of Heroes: The Great Vestibule (BB523); and (smaller piece) Hall Of Heroes: Gallery of Valour (BB524). Both are by Gale Force Nine of course. For the price I do think they are reasonable, especially for the time-strapped gamer. Yes, they could probably be made more cheaply, but for the balance of time and effort versus money saved, well I was happy to get these at the prices I paid. If I get enough games in using these this year, I may pick up some more items from the Hall Of Heroes range. 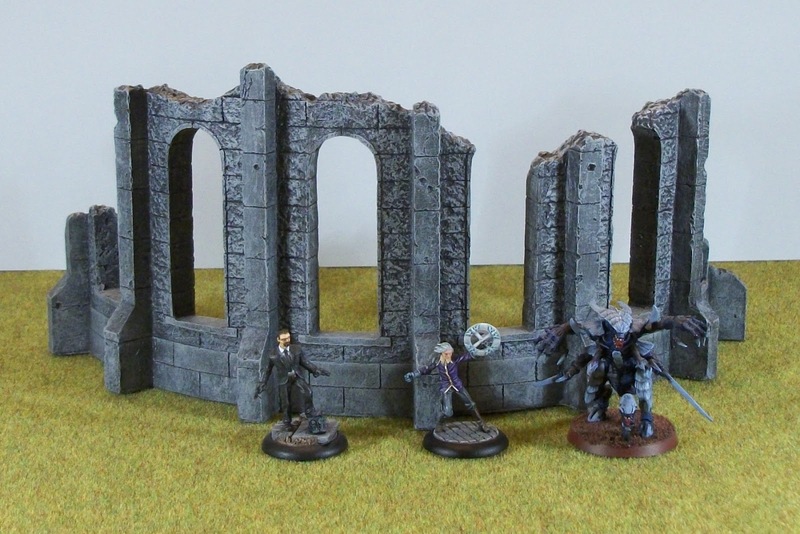 I will be posting up some more Gale Force Nine terrain in the near future. A New Year starts and I thought I would take a quick look back at the year gone by in relation to my minis hobby blogs. 2012 saw my third minis blog launch – Anima Tactician. I had high hopes for quick momentum into this new project which soon evaporated as I hit yet another painting slump in all genres. 2012 also saw a downturn in my overall minis painting, albeit with a surge in the final month (I painted 25% of all minis I completed last year in that one-month period). 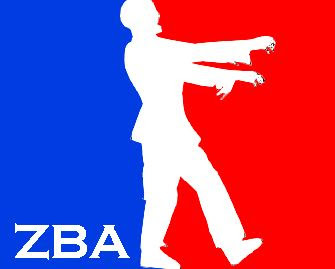 The year before had seen me paint more zombies in a short space of time than I thought likely. What did help at times last year were the Painting Challenges I agreed with Rob. Now I do not have the stamina for something like LAF’s Lead Painters League, but those month long challenges helped a lot, which is good – expect more in 2013. On to the minis and the blogging then. Now I know one factor which impacted this painting and blogging was stepping up my involvement in Pulp City, and with the bulk of that work completed I am setting myself a goal to paint more minis in 2013 than I did in 2012, and similarly blog more this year than 2011 (2010 was a high point I am unlikely to emulate alas). That means I will try and keep all 3 blogs active, and aim for around 15 or so posts per month across all 3. Posting this on all 3 does count 3 times over! Anyway, thanks to everyone who stops by and takes a look, or has a read; I promise more blogging in the year ahead and hopefully stuff of varied interest. Stay tuned! And feel free to comment and say what you would like to see.